2007 was a special year at Traquair. But anywhere marking its 900th anniversary must be very special indeed. It was in 1107 that Alexander I of Scotland signed a royal charter in the building that stood where the present house is to be found - in its early days the castle was used both as a royal hunting lodge and a place to hold court. In fact, one particular document still at the house dated from 1175 concerns the founding of a hamlet that would later become the city of Glasgow. The fortunes of Traquair have mirrored times of war and peace. After the death of Alexander III in 1286 it became one of the numerous fortified towers built along the Tweed in preparation for an English invasion. And though it was briefly occupied by English it returned to the crown with the accession of Robert The Bruce in 1306. 27 Scottish Kings and Queens have visited Traquair. Indeed, the cradle in which Mary Queen of Scots rocked her baby – the future James I of England – and the bed in which she slept can still be seen. Later, in 1738, the fifth Earl installed the Bear Gates at the top of the avenue which have remained shut ever since Bonnie Prince Charlie left the house for the final time. 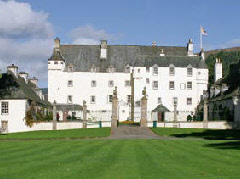 Today, it is the home of Catherine, 21st Lady of Traquair, her husband and their three children.